Everyone who is watching the news in the United States about the crisis in the Ukraine is getting the same story. On one side there is Russia, an evil autocracy that has launched an aggressive and illegal takeover of the Crimea to defend a corrupt regime against the wishes of the Ukrainian people. On the other side there are the Western governments, led by the United States, who are standing up for democracy, supporting a people’s revolution and defending Ukraine’s self-determination. It is a false picture. What we are witnessing instead are the world’s leading imperialist powers—the former colonizers of Asia, Africa, the Middle East and Latin America—attempting to take over Ukraine in an alliance with that country’s billionaire oligarchs and fascist parties. It is part of a long-term geostrategic plan to economically and militarily dominate the former Soviet republics and Eastern Europe, and to encircle Russia. Ukraine’s coup government has received the full backing of the biggest Western banks, and in exchange is preparing to enact economic policies that will devastate poor and working-class Ukrainians, regardless of their political affiliations or ethnic background. The West has funneled resources to the most reactionary and neo-Nazi parties whose ascendancy to power has pushed the country to the brink of civil war and secession. While claiming they are reacting to Russia, the Western imperialist powers have in fact launched an offensive against the working classes and peoples of Eastern Europe. Events are moving quickly and all the major powers of the West have set themselves in confrontation with Russia. They are demanding immediate withdrawal of pro-Russian troops, threatening sanctions and working hard to consolidate the coup government in Kiev. Ukraine stands at the brink of major war—both between Kiev and Russia, and potential civil war. What are the roots of the crisis? What is the make-up of the current government in Kiev and who supports it? What is motivating Russia and those in Ukraine rallying behind its troops? What is the United States after? The current crisis has short-term roots in the “Orange Revolution” of 2004, one of a series of color-coded mass protest movements in former Soviet republics that took place over a decade ago. In these "color revolutions," Western-oriented forces sought to shift the direction of their countries away from Russia into alliances with the European Union and United States. They evoked mass support from people who were fed up with corruption, oligarchy and stagnant standards of living, and those who desired greater independence from Russia. In Ukraine, the basic lines among the political parties that exist today were visible in 2004. Yanukovych and his Party of Regions received significant support in the East and South, and a collection of parties attached to EU neoliberalism maintained a stronger base in the Western part of the country. Both sides represented elements of the Ukrainian capitalist elite. The majority of “oligarchs,” the major capitalists who monopolize and control entire industries, are based in the East and supported Yanukovych in his last term. In the face of the Orange Revolution, Yanukovych lost the 2004 presidential election but then returned to defeat the same constellation of political forces in 2010. His opponent, natural-gas tycoon and former Orange Revolution leader Yulia Tymoshenko was subsequently imprisoned for corruption. The political split in the country clearly possessed grave geopolitical implications, and after his 2010 election Yanukovych tried to walk a tightrope. He sought closer relations with the EU and declared EU “integration” a key goal. At the same time, he maintained fairly strong relations with Russia, giving political support to it on occasions and extending the Russian lease on naval facilities in the Crimea. Yanukovych refused to pursue membership in NATO, which he knew would lead to sharp confrontation with Russia. The EU did not agree to Ukraine’s “full integration,” however, offering only a free-trade Association Agreement that would open up the country’s economy in several sectors and relax some visa requirements. But it also imposed political “reforms” and demanded the release from prison of western-oriented politicians like Tymoshenko. Their vision for Ukraine is not as a full member of the European Union but a sort of free-trade zone and neo-colony attached to it. Similarly, IMF loans for Ukraine were put on hold in late 2013 because of Ukraine’s “non-compliance” with its “economic policy conditions”—in particular, it had not devalued its currency as instructed or eliminated state subsidies to domestic gas supplies. Yanukovych tried to attract more favorable terms by offering EU access to Ukrainian markets and cheap labor—but to little avail. In sum, leading Western institutions like the EU and IMF demanded from Yanukovych a heavy price for Ukraine’s partial integration while strengthening the hand of his political opponents. Facing potential bankruptcy and default on its bonds, in November 2013 Yanukovych rejected the EU’s Association Agreement and instead accepted an economic package offered by Russia. The Russian deal offered far more in aid, discounted natural gas and appeared to come with none of the major economic adjustments demanded by the EU. This was the immediate spark for the EuroMaidan protests and the current crisis, which recalls the same basic divide as 2004. While there were considerable popular grievances against the corrupt Yanukovych government, it was the rejection of the EU Agreement that gave the opposition an opening to challenge him with the backing of the EU and U.S. government. The high political stakes of Ukraine’s internal crisis explain why this situation spiraled so quickly from a protest of a few thousand people in the direction of international war. While the West and Russia have had disagreements on other issues, few are of such central importance to Russia as the orientation of Ukraine and continued military access to the Crimea. Russia's interests extend beyond the profit motive or expansionist aims of different sectors of Russia’s capitalist elite; Ukraine and the Crimea have been considered foundational national interests—vital for the country’s self-defense and influence in the region—from the era of tsarism through the Soviet Union and the modern-day Russian Federation. The EU-U.S. capitalists have continuously extended the military reach of NATO eastward and pursued various plans for “missile defense” aimed at containing Russian influence. Using this combination of economic and military pressure, they have been gradually moving Eastern European and Central Asian countries away from various Russian regional initiatives. The “Eastern Partnership” in which the EU had intended to integrate Ukraine is a major component of the West's drive. Their overall strategy is obvious: to prevent Russia from establishing an independent regional bloc that would at least bear a passing resemblance to the Soviet Union and potentially set-up a more serious counter-hegemonic threat to Western imperialism. For Russia’s leaders, the country's re-emergence on the world stage has been a core objective for years, closely associated with Vladimir Putin’s rise to power. The fall of the Soviet Union greatly weakened the country, as it gave way to rapid privatization sprees, extreme inequality and the looting of the state sector. For a period the West had a virtual puppet in the person of Boris Yeltsin, but this arrangement could not last. Given Russia’s size, military and economic capacity, newly assertive and nationalist trends were bound to find expression among Russia’s consolidated capitalist class. The West’s moves in Eastern Europe are understood in Russia as an attempt to ring-fence their own ambitions, to block it from expanding back into its historic sphere of influence. The West's initiative in Ukraine, and potential encroachment on the Crimea, is therefore seen as a very serious and provocative move — an attempt to give Russia a knock-out punch just as it is putting itself back on its feet. Russian troops in the Crimea and other moves are essentially defensive. Russia is attempting to send a message that they will not allow a parliamentary coup to disrupt the status quo and forever alter the region’s political and military alignments. While Russia claims Yanukovych is at present the only legal leader of the country, because he was deposed by a coup, they are not attached to him. Rather they are pointing to the international agreement, which the EU itself engineered, for new Ukrainian elections in December. They are making moves to suppress opponents and drafted a ban on the Communist Party of Ukraine. This has been accompanied with a brutal street campaign attacking communists, anarchists and anti-fascists, including burning down the headquarters of the Communist Party and attacking the buildings of other radical groups. The Kiev government is receiving unconditional support from the West and has heavily integrated fascist shock troops into its coalition. It is not clear how much control the neoliberals have over the fascists in the Svoboda Party and Right Sector. Anti-fascists in Ukraine have pointed out that roughly 30 percent of the protestors at the Maidan were fascists. Clearly they are able to exert tremendous influence on the coalition. Six cabinet posts went to the Svoboda party along with a range of other ultra-right forces. This has sparked a counter-movement amongst many regions where people are protesting against the Kiev government. Many are expressing support for Russia as a counter-balancing or protective force. Russia has withheld further incursions beyond Crimea but other eastern cities are speaking of disaffiliation. Some of these regional governments do not accept leadership from Kiev. 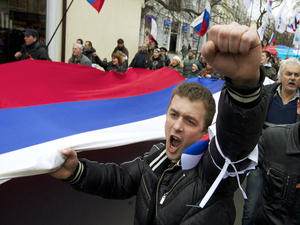 In Crimea, a vote for independence has been scheduled for March 16. The long-standing ethnic and regional divisions within Ukraine, which for a period had been submerged and eased, were reignited by the country’s elites and now become mass politics threatening to rip the country apart. Elections scheduled for May 25 are meant to give legitimacy to this new ruling coalition. Whatever the exact outcome, the character of the Kiev government supported by the United States is clear. The United States is now exploring a range of sanctions and financial support for Ukraine. It is insisting that Russia accept the new Ukrainian government as legitimate— which is very unlikely. Furthermore, the United States and Europe have declared they will not accept any sort of Crimean independence even if the people on the Crimea vote for it. Other regions may follow suit. Ethnic divisions within the regions may be unleashed, as national minorities like Crimean Tatars are likely to oppose affiliation with Russia. The West may try to wage a serious economic war on Russia, perhaps even seizing Russian assets abroad. Russia could shut off natural gas to the EU in retaliation. The stakes are extremely high and the deployment of EU nations’ troops could threaten regional conflict. The Russian military and other local self-defense militias are at present the only check to curtail the authority of the far-right, pro-Western Kiev government over Ukraine’s entire national territory. What appears superficially as the “peaceful” scenario—immediate Russian withdrawal, which is the main objective of Western governments—would at present embolden fascist forces and undoubtedly accelerate NATO militarism in the region. Military escalation, on the other hand, would likely stimulate ultra-nationalist sentiments in both Ukraine and Russia, threatening national minorities, Jews, Tatars and others. For progressive people and anti-imperialists, the current situation underlines the central importance of the leadership of mass movements. In our current era, with the weakness of the left, the far-right has reaped the fruits of populist uprisings. Revolutionary organizations—built on broad class solidarity and internationalism, not reactionary forms of nationalism— must be built. We must emphasize that the Kiev government is not a “popular” or representative government born of progressive protest, but a lash-up between pro-Western forces and fascists attempting to impose punishing economic policies on the Ukrainian people. In the current era of imperialism, dominated by a small club of Western powers, they stage interventions and support regime change operations the moment a government asserts an independent orientation or a more compliant regime can be found. They care nothing about popular legitimacy or self-determination, using any opportunity to encircle and undermine those they do not physically crush. It is folly for anti-imperialists to join in the chorus of condemnation against the Russian military so long as they are obstructing the EU-NATO-fascist takeover of all of Ukraine. During this rapidly changing situation, as the U.S. capitalist media howls and misleads, we must remain vigilant and precise in our message. The poor and working people of the United States and of the world have no interest in another regime change operation or imperialist war. All anti-fascist activity in the Ukraine, of which there is a militant historical tradition, must be whole-heartedly supported.